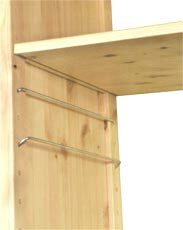 SHELFSTORE’s shelves and bookcases are the ideal children’s’ storage system. What makes our system the ideal kids' bedroom shelving? Besides its shear strength our shelving is incredibly versatile which allows you to continually rearrange the components as your child’s needs change and their toy and book collections grows and changes.